Acura CSX PDF Workshop and Repair manuals, Wiring Diagrams, Spare Parts Catalogue, Fault codes free download! The compact Acura CSX sedan is assembled in Canada, where one of Honda Motor’s largest assembly plants in North America is located. 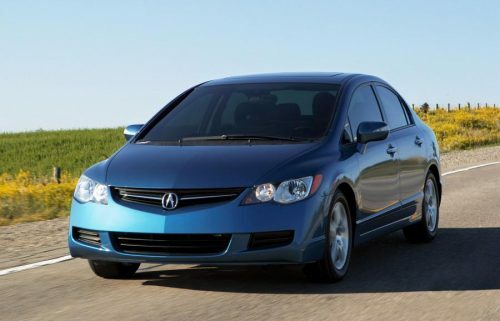 The car is largely unified with the eighth generation Honda Civic sedan, which is released here. CSX is characterized by a higher level of comfort. In contrast to the model Civic with a 1.8-liter engine capacity of 140 liters. s., CSX equipped with a more solid 2.0-liter engine in 155 liters. from. Under the order the automatic hydromechanical 5-speed box with possibility of a manual choice of transfers is offered, besides the traditional selector there are paddle shifters. The Acura CSX has disc brakes on each of the four wheels, as well as the McPherson’s independent spring-loaded front suspension and an independent rear multi-link spring suspension that allows the driver to easily drive and feel confident on the track.